**Outperform: Stock expected to do better than market return; has upside or cheap vs target price. Usually a buy call. **Market perform: Stock expected to be on neutral, can be + - 3% to 5% either way; Usually a hold call. **Underperform: Stock expected to do worse than market return; has downside or too expensive to buy vs target price. If fundamentals change a sell call. 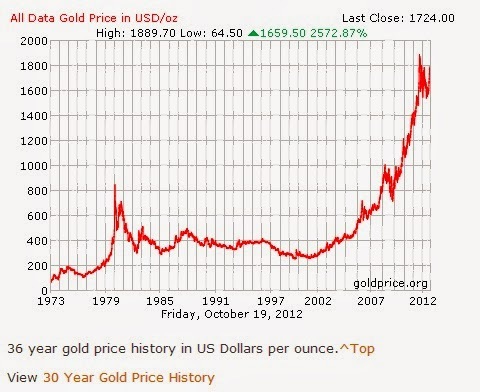 It has been slightly more than a year since I've warned about the crazy gold price. Being one of those not going with trend makes it difficult to back your claims especially when you are trying to convince your friends & family. 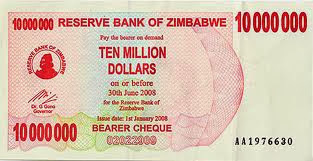 Folks think you are a fool for not banking on the precious metal. Ignorance is the root of many unwise decisions. Feng Shui masters at the end of 2012 are predicting $2000 gold prices after placing a giant stone lion in front of their house. It would be interesting to see what they are going to predict for 2014->Malaysia has good Feng Shui la...our lambang negara (national crest) carries two snarling or roaring tigers. Malaysia is very strong and steadfast as it carries two tigers so our economy & the 'property mart' will always grow as long as the BraiNless rule the country. Err....don't say I never warned you. Nevermind laaa you would call me a fool. Not I say one....I only have my Bachelor's Degree..i'm not a Master. The CLSA Feng Shui Index began life as a Chinese New Year card for our clients in 1992, with a simple summary of forecasts by a group of feng shui masters and a few views of our own. 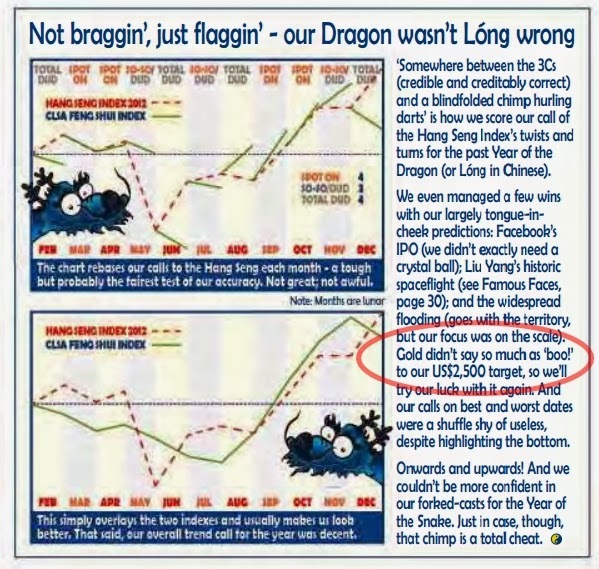 To flesh it out, we also predicted the performance of the Hang Seng Index based on the omens. No one paid much attention to the contrarian chart, but by year’s end it had correctly called all seven of the Hang Seng’s major turns. Now renowned by investors globally, the CLSA Feng Shui Index took a break during the bull run from 2005 to 2008. Much missed, it was revived in 2009. This year marks our 19th edition. Back in my Oct 2012 post: "To the disbelieve of ordinary folks, gold is just like any commodity. IT DOES NOT GO UP ALL THE TIME." Here's the original post: The Yellow Fever. Look at Investment + Central bank net pruchases (that's a lot of reduction in demand) while Jewellery and Tech has remained relatively stable. So it is a good time to get gold now? Aunty in ban san 'market' say must buy now. Uncle in kopitiam also said buy house now... Will the same bubble happen back in 1980 that stunned gold investors as prices traded sideways for 20 years? Gold trading sideways is highly not likely scenario this time because the amount of global debt is humongously high compared to 1980. Gold will remain as a safe haven against fiat currency (fiat = paper currency). You can print as much paper money as you can and devalue the currency (add more zeroes to the back) but you cannot make more gold than what your supply has hence the price is supported in the long run. I'll admit that I am not good at predicting how low prices can be because it is very difficult to do so but I am doing OK dissecting trends. While I see that the fair value of gold should be around $800 to $1000 and I not convinced that it will go down below the physiological barrier of $1000. Instead of predicting the price, my experience tells me it is always easier to look at indicators. Equities or stocks are by far the best indicator to look at. It does not correlate with gold prices. E.g. if US stocks fly high, gold prices would be the opposite OR if interest rates goes up, folks would rather invest in cash rather than gold. Explanation is simple: The money has to flow somewhere. Stocks have indeed hit new highs especially after the middle of 2013 but I see limited upside in 2014 as valuations are already higher than average now. The real driver of stock valuation increase would now be solely in the hands of a growing economy and the economy to look at in 2014 is the US economy. 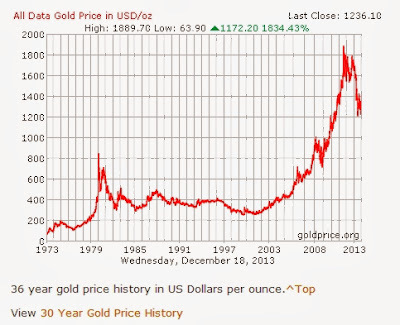 I think we will probably see gold trading sideways in 2014 subject to major global events that would rock the financial markets. Also known as iron pyrite, fool's gold is a gold-colored mineral that is often mistaken for real gold. Fool's gold is also a common term used to describe any item which has been believed to be valuable to the owner, only to end up being not so. Investments in hot stocks that seemed too good to be true, only to crash and burn, can be referred to as investing in fool's gold. How2 save RM100k in 4-5 years in 'Malaysia'?